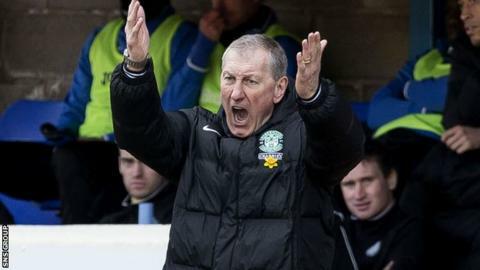 Manager Terry Butcher insists some of his underperforming players can salvage their Hibernian careers. Fifteen members of the Easter Road squad are out of contract in the summer and a run of one win in 13 games has seen their hopes of staying on recede. But Butcher said: "There are still opportunities for everyone. It's not as if I've made my mind up. "These next six matches are a chance for everyone to stand up and be counted and show me they want to be here." Hibs entertain Aberdeen on Monday, with Butcher admitting he has never felt lower in his five months in charge than after Sunday's 2-0 Edinburgh derby defeat by Hearts. "We've been backed into a corner," added Butcher on his side's wretched form. "Losing to Hearts has been the lowest part of my time here. But we need to come out fighting. "We are still trying to blend a team together that will win matches but we haven't got those combinations right. "We have chopped and changed the team and given everybody the best possible chance that they can have. I don't want anyone to say to me, 'I wasn't given an opportunity'." Among the players soon to be out-of-contract are midfielders Kevin Thomson and Tom Taiwo, who were told they could leave in January, goalkeeper Ben Williams, injured former skipper James McPake and Paul Cairney.